Max Scherzer and Rick Porcello still maintain their friendship. Max Scherzer, the $210 million man, will miss a lot of things about being a Detroit Tiger, but he will miss no one more than Red Sox righthander Rick Porcello, his baseball soul mate. Scherzer, who signed with the Nationals in February, started his career with the Diamondbacks but really learned how to pitch with the Tigers. He believes long talks with Porcello benefited both of them. The talks are reminiscent of the much-publicized chats the Braves’ Greg Maddux, Tom Glavine, and John Smoltz used to have in the dugout, dissecting every hitter, every at-bat, and figuring out what they could do to offset the hitter. Scherzer said he learned from Porcello, and Porcello has said how much he learned from Scherzer. Neither survived the Tigers’ purge. Scherzer rejected a six-year, $144 million offer from the Tigers last season, and baseball people thought he and agent Scott Boras were crazy. Scherzer wound up with nearly $70 million extra in a uniquely structured contract that will pay him until 2028. Not so crazy after all. Joe Maddon made the biggest managerial news this offseason, moving from the Rays ot the Cubs. Porcello, meanwhile, was traded in his walk year to the Red Sox for outfielder Yoenis Cespedes, who is also in his walk year. There are a few baseball executives who believe Porcello will walk from the Red Sox and do exactly what Scherzer did, go to the highest bidder. Scherzer still texts a lot with Porcello, and they have had conversations about free agency. Scherzer believes talking about the game while it’s happening helps a pitcher take mental notes on a hitter for the next time he faces him. It can be more valuable than watching video or going through spray charts. “We really helped each other out,” said Scherzer, who owns a 91-50 career record. “He saw things about me and made suggestions. I saw things about him and made suggestions. Things we’d see from the bench on how I was attacking guys. Scherzer agreed that Porcello made a jump last season. Scherzer, 30, is not into predictions, but he thinks the 26-year-old Porcello will improve and hit free agency with an impressive résumé. 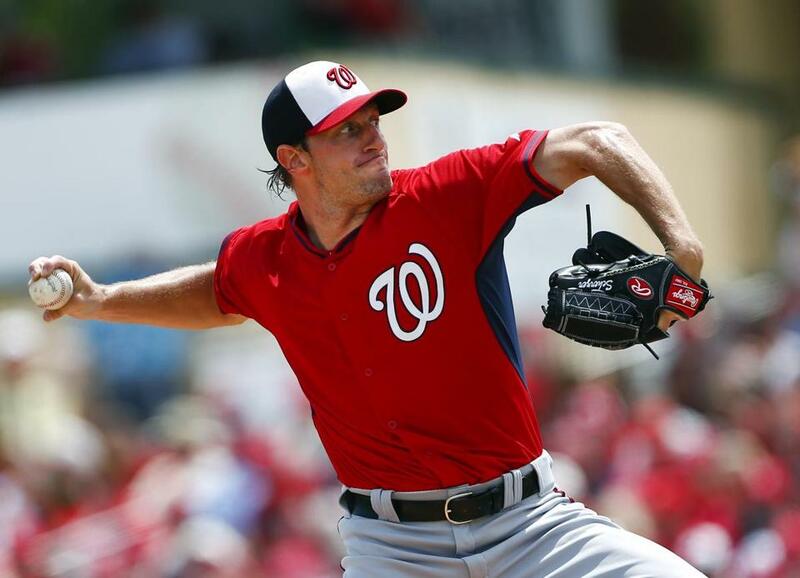 Scherzer, after finishing a robust six innings on Wednesday afternoon against the Cardinals in which he struck out nine with no walks, wasn’t making any predictions about Washington’s uber starting rotation. Scherzer wasn’t buying that the Nationals are prohibitive favorites to win the National League East, and possibly the World Series. None of that impresses Scherzer, who was part of a Tigers rotation that also included Justin Verlander, Anibal Sanchez, and at one time current Nationals teammate Doug Fister. But the Tigers could never get over the hump in the playoffs. Scherzer, the 2013 American League Cy Young winner when he went 21-3 with a 2.90 ERA, is big on talk being cheap and that the proof is in the performance. Scherzer does acknowledge that the rotation has all the pieces. The uber rotation may not be together for long. Jordan Zimmermann and Fister will be free agents at the end of the season. The Nationals may not re-sign Zimmermann, instead accepting a draft pick. While Scherzer hopes to stir up dialogue with his new teammates, he remains close with Porcello. Asked whether Porcello can be a No. 1 starter, Scherzer said, “That number crap, I don’t subscribe to. In Detroit we had . . . it doesn’t matter . . . just go out and do your thing. 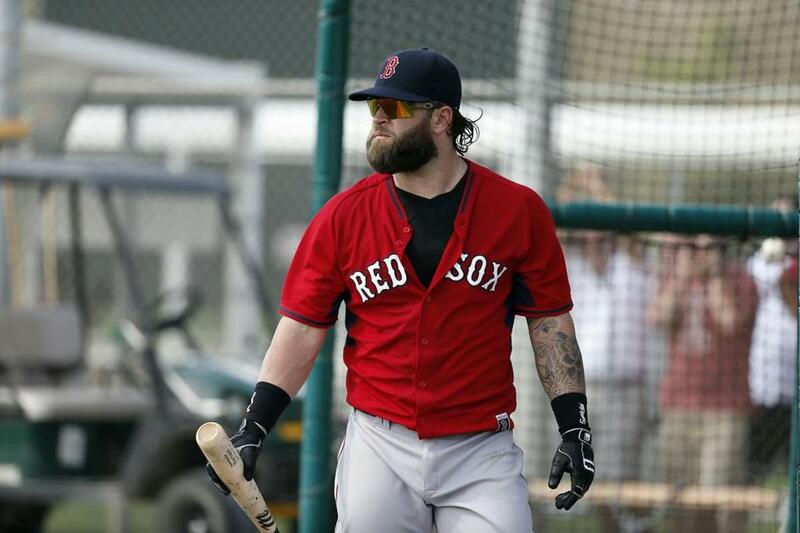 Mike Napoli could be a trade chip to help the Red Sox deal for Cole Hamels. 1. Boston Red Sox — They need to deal for Cole Hamels. The starting five won’t likely be enough for this team to separate itself from the pack. Explore deals for Allen Craig or Mike Napoli. Craig may be a better long-term fit and cheaper. 2. Toronto Blue Jays — They need to trade for Jonathan Papelbon or sign Rafael Soriano. Why do relatively good teams leave themselves short in such an important area? The Jays are owned by Rogers Communications, so they shouldn’t cry poor mouth. Teams wanting to solve problems from within is understandable, but sometimes by doing that teams rush players or put them through unwanted pressure. 3. Tampa Bay Rays — Their injured pitching will eventually come back, but their hitting will remain weak. Is there any reason to ever pitch to Evan Longoria? Andre Ethier, Ryan Howard, and Carlos Quentin are out there for the taking with their teams willing to absorb big bucks. Yes, it’s only spring training, but Howard has looked good physically and at the plate. Scouts have noticed he’s driving the ball to center and right fields, which is what he used to do. 4. Detroit Tigers — Don’t leave yourself short again in the bullpen. Joe Nathan has declined. Give up something for Papelbon. Joakim Soria and Angel Nesbitt have looked the best among Detroit’s relievers, but Nathan is sitting at 89-92 miles per hour and not instilling much confidence that he’ll hold up. 5. New York Mets — They need to go and get Orioles lefthander Brian Matusz to fill out their bullpen or use him as a fifth starter. Are they serious about winning the NL East? 6. San Francisco Giants — OK, maybe they wait until the trading deadline to do something, but with Hunter Pence out for a couple of months, they need a hitter. Craig or Shane Victorino makes a lot of sense. 7. New York Yankees — Like the Red Sox, they could use an ace. They should also be in the Hamels hunt to protect themselves against Masahiro Tanaka or CC Sabathia breaking down again. If the Yankees stay healthy they’re good, but they need that front man in the rotation. 8. Los Angeles Dodgers — Another team that’s about to leave itself short of starting pitching. Hamels would be big here, teaming up with Clayton Kershaw. They’re the only two pitchers last season who had 23 consecutive starts in which they allowed three or fewer runs. 9. Texas Rangers — They’re in a tough division and maybe they just don’t have enough to contend. But if they think they do, they’re yet another team that makes sense for Hamels. They have a young catcher — Jorge Alfaro — the Phillies want. With Yu Darvish gone, the Rangers give themselves a chance to stay in the hunt with a healthy Prince Fielder and Shin-Soo Choo returning to a lineup that’s still pretty good. 10. Cleveland Indians — Another starting pitcher would be ideal. They could use more starter depth with Danny Salazar having an awful spring training. 1. Baseball has amazing symmetry, doesn’t it? At the same time Pete Rose is applying for reinstatement after 25 years of being banned for gambling, we now have Marlins pitcher Jarred Cosart under investigation for possibly betting on baseball. Different times, different world. Cosart was exposed because of messages on Twitter. He is claiming his account was hacked. Not far-fetched, but he’ll have to answer to it, and so far he has cooperated with Major League Baseball. 2. One thing teams should do, according to a wise veteran scout, is acclimate to cold weather after spring training. It’s shocking for some to go from the warmth of Florida or Arizona to cold weather for the first six weeks of the season. Would breaking camp a little earlier and spending four or five days in the cold help this process? 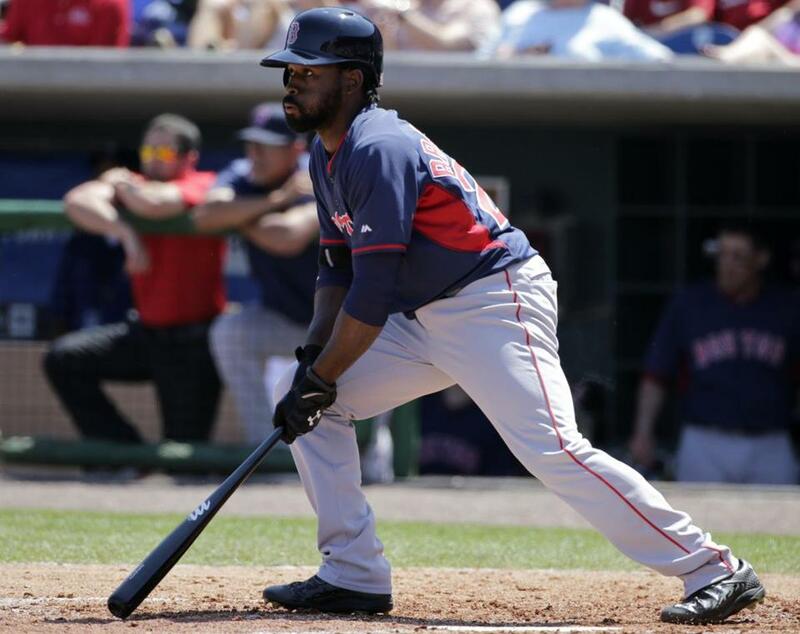 It seems Jackie Bradley Jr. has made necessary adjustments to address his hitting struggles. 4. Frank Viola will be the Mets’ Triple A pitching coach in Las Vegas. His main job? Make sure prospects Noah Syndergaard, Steven Matz, and Matt Bowman are ready for the next step. “They are all top pitchers in their own right, but there’s still some developing to do, and I’m in charge of making sure they all continue to make strides and refine the little things that will make them big leaguers,” said Viola. Those who have followed Viola’s work feel he’ll be a major league pitching coach in the near future. 6. Ryan Hanigan says Clay Buchholz reminds him, repertoire-wise, of Reds righthander Homer Bailey. Hanigan was Bailey’s personal catcher in Cincinnati. 1. Dan Uggla, 2B, Nationals — Uggla has an April 1 opt-out of his minor league deal, but his .323 average, two home runs, six RBIs, and 1.042 OPS in 31 at-bats is giving Nationals general manager Mike Rizzo something to think about. Uggla is proving that his stroke is back after offseason treatment to restore his balance after suffering previously undetected concussions. The problem now, is roster space. The Nationals have Yunel Escobar, who can fill in at third or play second while Anthony Rendon is out. Or the Nationals could keep Ian Stewart, who can play third base. The Angels, Braves, Orioles, Cardinals, Blue Jays, Padres, and Rays could justify bringing Uggla aboard. 2. Jung-ho Kang, INF, Pirates — The Korean superstar hasn’t hit well in spring training (3 for 27 with a home run), but GM Neal Huntington said Kang has flashed the 40-homer power he had in Korea and is still acclimating to major league pitching. Huntington doesn’t think Kang will have any problem with velocity. For now, they will deploy Kang as a rover in the infield. 3. Jason Heyward, RF, Cardinals — The Cardinals really need Heyward to hit for power. They were 29th in home runs last season. Heyward hit 27 in 2012 with Atlanta (and has never hit 20 or more before or since). Mid-20s is what the Cardinals are hoping for as a lefthanded complement to Matt Holliday. 4. Manny Delcarmen, RHP, Nationals — The East Bridgewater resident likely will end up at Triple A Syracuse. Maybe he doesn’t throw the 95-96 of his Red Sox days, but scouts have him at 92 and with good location. The Nationals have some hard throwers who are also going back to the minors, but Delcarmen feels good about his comeback, which began last season in Syracuse. 5. Jason Marquis, RHP, Reds — Marquis has had a very good spring training (3.15 ERA in five starts) and it appears the Reds will likely use him as their No. 5 starter while Homer Bailey recuperates from a forearm injury. Marquis, who grew up in the Braves’ system and had some good years with the Cardinals, has worked through myriad injuries, including bone chips in his elbow, a broken fibula, a broken wrist, and Tommy John surgery. 7. Craig Kimbrel, RHP, Braves — Those in the organization insist they will not entertain a deal for Kimbrel. But if it’s the trading deadline and you’re in last place or close to it, a few executives predict a change of (John) Hart. The Braves are really of the mind that 2017 is their relaunch, so why the need for a closer? 8. Grady Little, scout, Pirates — Huntington is thrilled to have Little on his staff. “He’s such a great mentor to our younger scouts,” Huntington said. “He’s a great baseball man who has contributed a lot to our organization in more than a year that he’s been with us.” Little’s role has put the Pedro Martinez decision in 2003 in the rearview mirror. “One decision doesn’t define a great career,” Huntington said. 9. Jhoulys Chacin, RHP, free agent — The Rockies tried to trade Chacin but couldn’t find a buyer, so they released him last week. At 27 years old and out of Coors Field, he seems like a possible fifth starter for many teams. Chacin was a victim of Coors, where his ERA was 4.21, vs. 3.24 away from Coors. The Red Sox, Dodgers, Rays, and Blue Jays have been looking for a veteran starter and may be considering him. From the Bill Chuck files — “In 2014, Jeff Samardzija, Felix Hernandez, Yovani Gallardo, and Cole Hamels led the majors with 11 quality start no-decisions.” Also, “Since 2006, Maicer Izturis has had 3,019 plate appearances and has struck out just 314 times.” . . . Happy birthday, Scott Atchison (39) and Juan Bell (47). Correction: An earlier version of this story cited Max Scherzer as saying Rick Porcello was motivated by money. He said Porcello was motivated by winning.